Last October when I boarded a plane for Nerdapalooza 2013, that marked the first time I had ever boarded a plane for the sole purpose of performing somewhere else in the country. 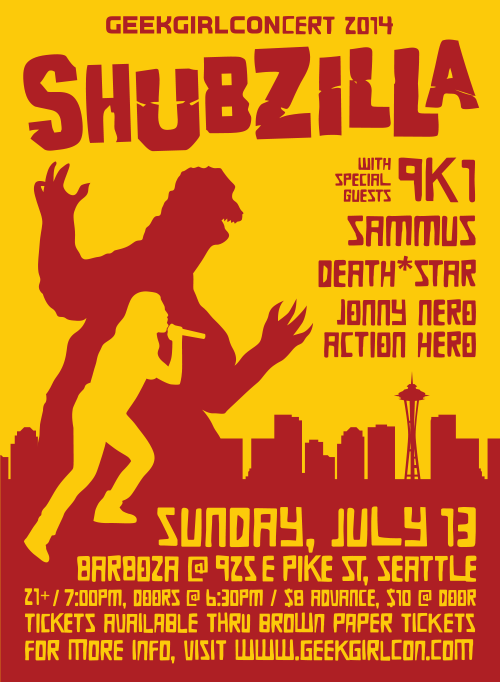 Well now I can add another show to that list, because this summer I’ll be flying cross country to take part in the GeekGirlCon benefit concert thanks to the homey Shubzilla. If you happen to be in the Seattle area on July 13th at 6:30pm PST please head to Barboza [925 E Pike] and support the cause. To purchase tickets ($8 advance; $10 at the door) go HERE and to RSVP on Facebook go HERE. See you there!